Benji Wong, otherwise known as Benji WZW, is one of the many unconventional fashion designers flocking to Toronto to present a collection at |FAT| (Fashion Art Toronto) this week (April 22-26). The Hong Kong native was raised in Toronto and studied architecture at University of Waterloo, before up and leaving for a fashion program at Royal Academy of Fine Arts in Antwerp. His 2013 graduate collection "That Paradise Would Be A Meme" pulled together everything he learned from both experiences, resulting in a surreal work of art that attracted the attention of a whole whack of contemporary publications. 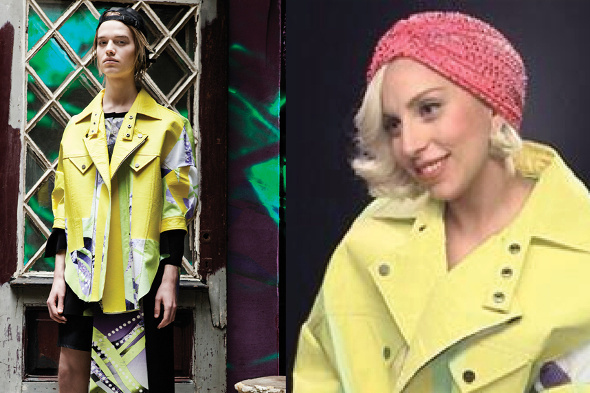 Lady Gaga even wore a jacket from the collection in an eTalk interview. "Fall in Love With Machinery" is Benji's first endeavour out of school, and according to him, there's no better place to make his Fall/Winter 2014 debut than his hometown on the |FAT| runway this Thursday. After getting a chance to preview the menswear pieces in the flesh, I know he'll fit right in. Taking inspiration from Japanese biker gang bosozoku, the collection narrates a story of hurt and heartbreak. Innovative fabric treatments and meticulously handcrafted details illustrate the push and pull of a poised, polished surface - broken and jagged on the inside. Digital-printed faux leather and couch foam bonded to silk satin give the biker jackets, trench coats, and kilts a structured silhouette; 3D printed embellishments, handpainted belts and holographic imagery suggest there's more to them than meets the eye. My favourite facet is definitely the creepy-cool baby motif found throughout the collection - most notably in the form of a giant helmet. 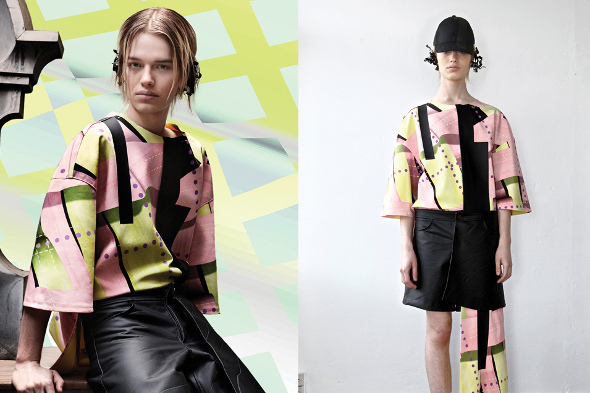 Always teetering on the fine line between wearable garment and postmodern sculpture, Benji WZW - together with |FAT| - is going to shake up the otherwise conservative Canadian fashion industry one avant-garde menswear piece at a time. Tickets are available online or at the door, at $35 per day or $100 for a full week pass.